A Venezuelan snake handler was killed by a Burmese python after he broke security rules to visit the 3-metre snake alone at night. Shocked workers who found the python trying to swallow him headfirst the next day had to fight the snake to make it surrender its gory meal. It sounds like something out of Weird Tales. An assistant animal handler at the Terrarium in Parque del Este was found by horrified co-workers on the morning of Saturday, August 23, in the cage of a Burmese python that had killed him and was trying to swallow his head. According to initial reports the workers had to beat the 3-metre (10 ft) snake to get it to release the body of the young man, Erick Daniel Arrieta Marquez, who had entered the snake's cage at night when he suffered the fatal attack. Two wounds on his left arm suggested the snake had bitten him first and then wrapped around him, slowly crushing the air out of his body before starting to swallow him. The fire service were called at 7:10 in the morning but when they arrived, the man was dead. Arrieta Marquez, 29, was a biology student from Santa Barbara in Zulia State, who was working at the Terrarium while he studied at the University of the Andes. His job entailed giving guided tours of the snakes, spiders and scorpions in the Terrarium, which is run by a concession in the park called Zoocriadero Ecopets. 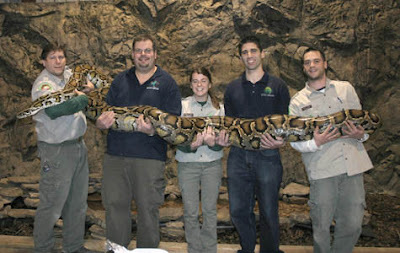 Based on a petting zoo, visitors who take the guided tours are allowed to handle some of the non-dangerous snakes. Arrieta Marquez had recently returned from holiday and was doing night shifts. However, mystery surrounds his death, as he was not supposed to enter the cage of the python while alone at night. The director of Parque del Este, Javier Hernandez, told Venezuelan daily El Universal that "the young man underestimated the animal's instincts" and had broken the security rules. Burmese pythons are not native to South America. The snake had been found by hikers a few months earlier on the Avila mountain, near some electricity pylons. Knowing it was not native to the park they had brought it to Parque del Este and donated it to the Terrarium. It is believed to be a pet that got too large and was released in the dense forests of the Avila to fend for itself. It was being kept in a restricted part of the Terrarium for observation and study. Co-workers said Arrieta Marquez had developed a fascination for the animal and liked to feed it with rodents. Another strange element to the story is that the police believe the young biology student stripped naked before entering the snake's cage. The boa basically grabbed him and squeezed him and squished the life out of him and then swallowed his head. Do you think if nobody had missed him the snake would have been able to swallow him all? This proves that snakes do try and eat humans and all the BS they tell you at school that this stuff never happens is like... BS. I'm gonna be real careful with snakes from now on. It all very possible …but naked?